Need more information about booking Home 7307357 ? Cozy 4 bedroom 2 storey villa, located in the famous district of Paphos, Peyia, near the famous beach of Coral Bay. The villa is fully equipped with everything you could need for your holiday. 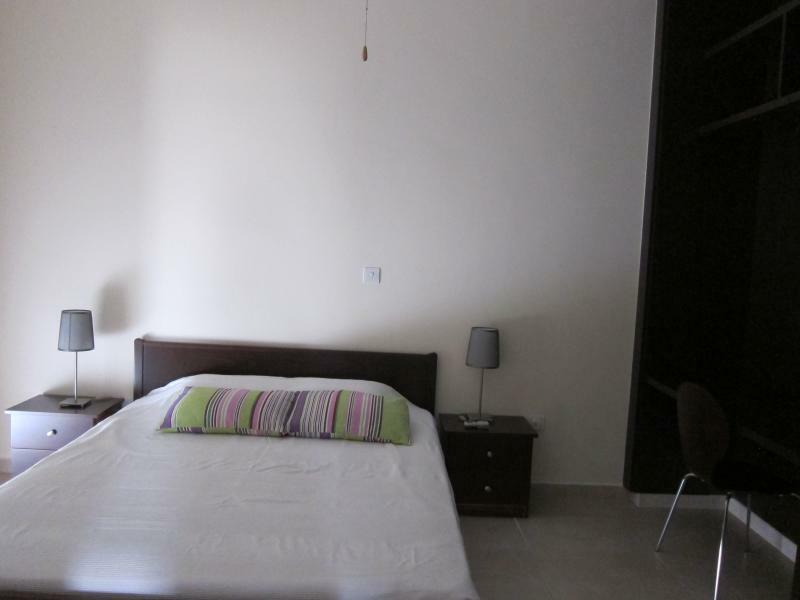 There are three bedrooms on the second floor with double beds, one bedroom with a private bathroom. Also on the 2nd floor there is another full bathroom. In each room there are built-in wardrobes, air conditioning, ceiling fans. On the ground floor there is another bedroom with a single bed, fitted wardrobes and dressing table. Also on the ground floor has a bathroom with shower and storage area. In the living room on the first floor of the villa has three sofas (one of which converts, 1 extra bed). Fully equipped kitchen-dining room with fridge / freezer, hob, oven and extractor hood, microwave, toaster, kettle, dishwasher, washing machine, iron and all necessary utensils. Dining table and 6 chairs are located in the lobby next to the kitchen. The living room has a television area with satellite TV, Wi-Fi internet is available free of charge. Car: recommended The villa has a fruity (citrus: orange, lemon, pomelo, kumquat) garden. The ground floor also has air conditioning and ceiling fans. Bed linen and bath towels and beach towels are provided. The villa can comfortably accommodate up to 7 people. Уютная 4-х спальная 2 этажная вилла, расположена в самом известном районе Пафоса Пейя недалеко от известного пляжа Корал Бей. Вилла полностью оборудована всем, что вам может понадобиться для вашего отдыха. Имеются три спальни на втором этаже с двуспальными кроватями, одна спальная с собственной ванной комнатой. Так же на 2-м этаже есть еще одина полноценная ванная комната. В каждой комнате имеются встроенные шкафы, кондиционеры воздуха, потолочные вентиляторы. На первом этаже есть еще одна спальная комната с односпальной кроватью, встроенными шкафами и трюмо. Также на первом этаже есть ванная комната с душевой кабиной и кладовкой. В гостиной на первом этаже виллы имеется три дивана ( один из которых раскладывается, 1 дополнительное спальное место). Полностью оборудованная кухня-столовая с холодильником / морозильником, кухонной плитой, духовкой и вытяжкой, микроволновая печь, тостер, чайник,посудомоечная и стиральная машины, утюг и все, необходимые кухонные принадлежности. Обеденный стол и 6 стульев расположены в холле рядом с кухней. В гостиной имеется телевизионный уголок со спутниковым телевидением, Wi-Fi интернет предоставляется бесплатно. Прокат автомобилей: Рекомендуется Вилла располагает фруктовым (цитрусовые: апельсин, лимон, помело, кумкват) садом. На первом этаже также имеется кондиционер и потолочный вентилятор. Постельное бельё и банные полотенца, а также пляжные полотенца предоставляются. На вилле может комфортно разместиться до 7 человек. Электричество не входит с стоимость проживания и оплачивается дополнительно по счетчику по тарифу 0,30 центов за киловатт/час наличными в день отъезда. You can get in touch with Grigory (the owner) through the contact form on this page. Send Grigory (the owner) an email through the contact form on this page. Alternatively, if there’s a phone number on this page, you can call them. How do I contact Grigory (the owner)? If you’ve already booked, go to Manage your holiday booking to view Grigory the owner's contact details or send them a message. Or send Grigory (the owner) an enquiry through the Contact the owner/manager form if you’d like a quote or more info first. When you pay online through the Book your stay form, a booking request is sent to Grigory (the owner). You’ll find out within 24 hours whether they’ve accepted - no money will leave your account before then. You can also request a quote from Grigory (the owner) through the contact form. The owner will email you the total cost for your dates and a link to book and pay online. Use the Book your stay form to pay provisionally online. You can pay by credit/debit card or PayPal. Grigory (the owner) will have 24 hours to accept the booking and no money will leave your account before then. Why can't I call Grigory (the owner) before booking? You’ll need to contact Grigory (the owner) to do this. Send them a message in Manage your holiday booking or through the contact form on this page. You can request to change the dates or number of people on your booking via the Manage your holiday booking page. To change your holiday dates use the Edit booking button. If you need to change the number of guests staying then send Grigory (the owner) a message. If Grigory (the owner) agrees, they’ll send you a revised quote outlining the changes. You can review and accept/decline this from the Manage your holiday booking page. You’ll have 48 hours to take action before the revised quote expires.